Global SMT Placement Equipment Market – Industry Analysis and Forecast (2018-2026) – by Type, by Application, and Region. Home » Reports » Electronics » Global SMT Placement Equipment Market – Industry Analysis and Forecast (2018-2026) – by Type, by Application, and Region. SMT (surface mount technology) component placement systems, usually called pick-and-place machines, are robotic machines which are used to place surface-mount devices (SMDs) onto a printed circuit board (PCB). A key driver for the global SMT placement equipment market is the growing demand for PCBs. PCBs form the core of electronic devices and provide an electrically conductive path for many components such as capacitors, resistors, transistors, ICs, and diodes. The important driving factor of SMT in manufacturing includes reduced board cost, reduced material handling costs, and a controlled manufacturing process. SMT components occupy small as of this only one-half to one-third of the space on the printed circuit board. Restraint factor of the market is SMDs’ solder connections may be damaged by potting compounds going over thermal cycling. Manual prototype assembly or component-level repair is more difficult and needs skilled operators and more expensive tools, due to the small sizes and lead spacing’s of many SMDs. Based on the application, Telecommunication equipment segment is leading SMT placement equipment market. Growing of telecommunications equipment expenditures, more-intense competition, launches in introducing new products. Telecommunication equipment, the most prominent industries in India, will continue to contribute significantly to India’s GDP in the coming years. The mobile revolution and adoption of technologies such as WiMax and VoIP are requiring original manufacturing of various telecom products such as handsets, base stations, modems and VOIP phones, thus creating the demand for SMT equipment. 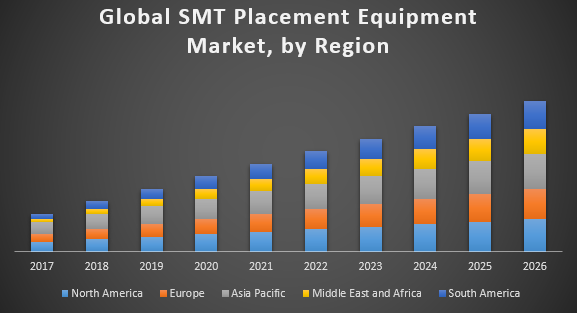 In terms of the region, Asia-Pacific is expected to offer growth opportunities for the global SMT placement equipment market, owing to steady economic growth in countries such as China and India. The region’s improved presence in electronics manufacturing and original design manufacturing businesses, in turn, is enhancing the demand for SMT equipment. Key players operating in the SMT placement equipment market, Air-Vac Engineering, Assembléon, Cognex Corporation, Conceptronic, CyberOptics Corporation, Dover Technologies, Electro Scientific Industries Inc., Fuji Machine Manufacturing Co., Ltd., Glenbrook Technologies Inc., Juki Automation Systems Inc., KLA- Tencor Corporation, Lixi Inc., Nordson Corporation, Orbotech Ltd., PPT Vision Inc., Teradyne Inc., Universal Instruments, Viasystems Group Inc., X-Tek Group Inc., and YXLON International FeinFocus GmbH. • Electro Scientific Industries Inc.
• Fuji Machine Manufacturing Co., Ltd.
• Juki Automation Systems Inc.
• YXLON International FeinFocus GmbH. 14.3.7. Electro Scientific Industries Inc.
14.3.8. Fuji Machine Manufacturing Co., Ltd.
14.3.10. Juki Automation Systems Inc.